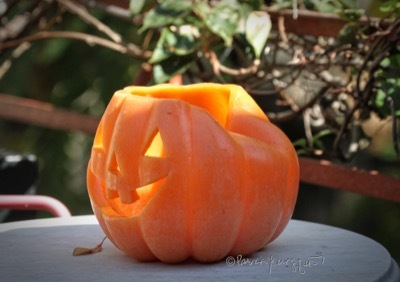 The Last Leaf Gardener: Wednesday's Wisdom:To All Jack-O-Lanterns — STAY IN THE SHADE! Wednesday's Wisdom:To All Jack-O-Lanterns — STAY IN THE SHADE! For a brief time, in bygone years here on Blogger, I ran a series called Wednesday's Wisdom, and today Wednesday, October nineteenth, I am launching it again. 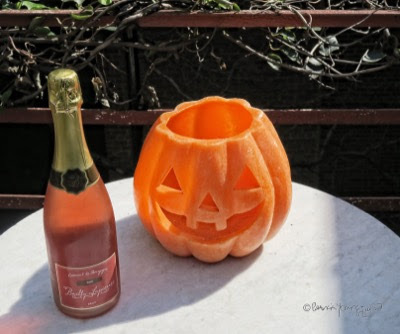 I was prompted to do this by one of the Jack-O-Lanterns who made his annual pre-Halloween visit to my rooftop garden in NYC. He can be seen (in the first two pictures atop this entry) sunbathing as he soaks up the sun's rays while sitting on a table in my rooftop garden. And as you can see, he spent too many hours working on his tan, for his head caved in from the sun's heat. We've had record breaking temperatures in NYC these past few days and my Jack-O-Lantern did not realize how the heat affected his head! Therefore, he asked me to post content warning his comrades to stay in the shade when visiting gardens! 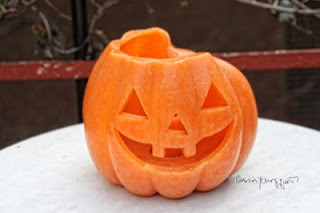 However, I confess that when I saw my injured pumpkin I thought that one of the birds who visits my garden had landed too heavily on the Jack's head. But the Jack assured me that the larger birds who visit here such as (American Robins, Bluejays, Common Grackles, Northern Mockingbirds, Mourning Doves, and Pigeons) have never used him as a landing point. He did say that the House Finches have perched on the head of his comrades (as seen below) but insisted that could never cause an injury to the head of any Jack-O-Lantern! Before surmising that my Jack's head injuries were from him staying in the sun too long, I thought he had attempted to open a bottle of bubbly that he had posed (next image) with one day prior to his injury. But alas, the poor fellow sustained his injuries from sunbathing during temperatures that NYC has not seen since 1928! Fortunately his wound is not giving him any pain (wish I could say the same for the head injury I sustained this past May), however, as I've stated, he did ask me to post some words of wisdom for the community of Jacks. And his request has prompted me to restart my Wednesday's Wisdom series.